Liquid ring vacuum pumps have been employed for removing air from steam surface condensers and industrial processes for over 40 years. 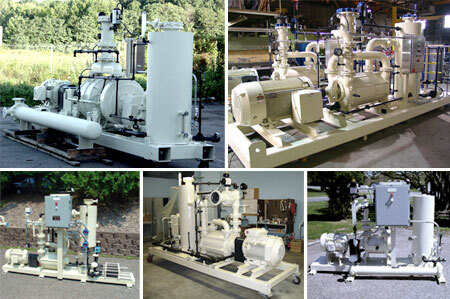 They are among the simplest, most reliable method known of pumping gases. A typical vacuum pump Air Removal System for steam condenser service consists of two, identical 100% capacity pump skids. It is common practice to use both pumps simultaneously to evacuate or “hog’’ the condenser to the point where steam can be introduced into the turbine, and then one pump shuts down while the other goes into “holding mode” to continuously remove air from the condenser during turbine operation. In the air removal application, liquid ring vacuum pumps are employed to evacuate air and any other non-condensable gases from the steam space of the main condenser that services a steam turbine. This gas removal is done for the purpose of eliminating the insulating effect that non-condensable gases have on the transfer of heat from steam through the tubes to the cooling medium. Without a vacuum system, air would severely reduce the efficiency of the heat transfer, resulting in the condenser surface area increasing many times for a given steam load. Unique Systems vacuum pump exhausters are typically two-stage vacuum pumps. For hogging operation, the first-stage is employed to evacuate air at high absolute pressures, and the second-stage is by-passed to optimize efficiency and reduce peak horsepower demand. Both systems operate automatically to evacuate the condenser to a pressure determined by the requirements of the steam turbine. At this point, the system pressure switch sends a signal to shut-down the “lag” pump, while the “lead” pump continues operating in holding mode. At around 20” HgV, the second stage of the vacuum pump begins to operate efficiently, and the inter-stage bypass check valve closes to allow two-stage pump operation.